$/€/£32 FREE for each $/€/£10 deposited! Most Microgaming casinos offer up to 250 slots, including 3 reel slots, 5 reel bonus slots, AWP's and Fruit Machines. There are up to 500 games in the full line up including card games, table games, keno. The Microgaming casinos offer up to 23 progressive slot jackpots. Some popular multi-bonus round slots include Cashanova, Mad Hatters, Jolly Jester, Witch Doctor, Hitman, Prime Property, Tomb Raider - Secret of the Sword and the 100 payline stacked wild slot Cashapillar. One of the most played slots of all time is Thunderstruck and the second release Thunderstruck II. Microgaming releases new bonus slots monthly. The Microgaming Casinos accept most visitors worldwide for real money play except USA players. Each casino offers a variety of deposit options including Visa, Mastercard, NETeller, EcoCard, Instadebit, UseMyFunds, EntroPay, Ukash, Moneybookers, Click2Pay, ClickandBuy, EZipay, Citadel Direct to name a few. Some players can even deposit using their PayPal account depending on where they're located. Withdrawals are usually fast but does vary from casino to casino so be sure to look over the withdrawal options before registering. Visit the casino banking page for all deposit and withdrawal options and always read the bonus terms before playing. The Microgaming Viper casino lobby allows players to sort and view games in a variety of ways including style, paylines or bonus round features. Move your mouse over a game title and it displays all the game details and a thumbnail of the game. Each game let's you control many features like sound, speed and credit display. You can review your game stats, like number of spins, playing time and top 3 wins. There is even an expert mode. The Microgaming Casino Lobby features a Jackpot Thermometer ranging from 80 to 999 for each game. The reading indicates the last time a jackpot was won. The formula is 80 + (the last time a jackpot was won/average time between jackpots) * 100. A high number indicates the jackpot hasn't been won in a while a low number indicates a recent jackpot win. You can see the Microgaming Lobby from 32 Red Casino in the screenshot below. You'll be able to review the Jackpot Thermometer when installing any MG casino. Another great feature of Microgaming Casinos is their CashCheck and PlayCheck tools. With the CashCheck tool players can easily track their banking transaction history, including deposits, withdrawals and free bonus money. With the PlayCheck tool players can check their game session play. Each Microgaming Casino is regularly monitored by independent auditors and both overall and individual game payout reports are listed on the casino site. Microgaming Casinos use the Clear Play Bonus System. The ClearPlay Bonus System automatically splits your casino account in to a cash balance and a bonus balance. Your combined total is always available for play while you can instantly see the bonus amount remaining to be played through before winnings can be withdrawn. Microgaming Casinos accept Australian, Argentinian, UK, Canadian, Spanish, Dutch, Russian, German, Italian, European and most other International players. USA player are not allowed to play for fun or real. Typical Deposit and Withdrawal methods at most Microgaming Casinos include: Visa, Mastercard, NETeller, ECOcard, Instadebit, UseMyFunds, EntroPay, Ukash, Moneybookers, Click2Pay, ClickandBuy, EZipay, Citadel Direct, Ticket Premium. Supported currencies include USD, EUR, GBP, AUD, CAD, DKK, SEK. 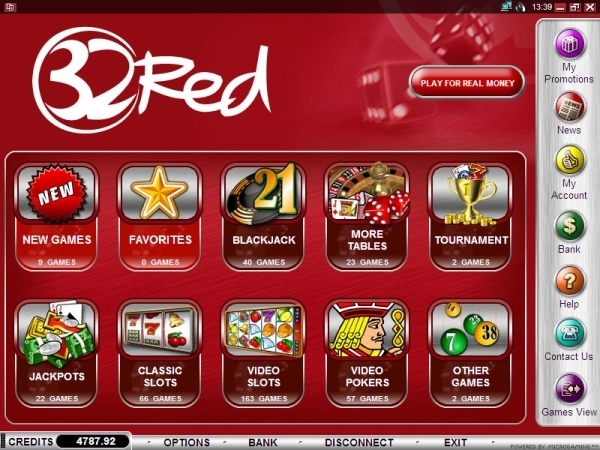 Visit 32 Red Casino - Get $/€/£32 FREE for every $/€/£10 Deposited!